This time last year, I saw an interesting medium-sized tree at Mishref co-op with strange flowers all over it. I think we need more flowering trees in Kuwait. I didn’t know its name, and usually at this point I would have taken a small cutting. However, there were a few boys playing there and I didn’t want to encourage any plant attacks… In May last year, I described it to a man at the garden centre – olive leaves and saffron flowers was my description – and he gave me a small shrub. I was convinced it was the wrong one – but I’m so glad I trusted him. 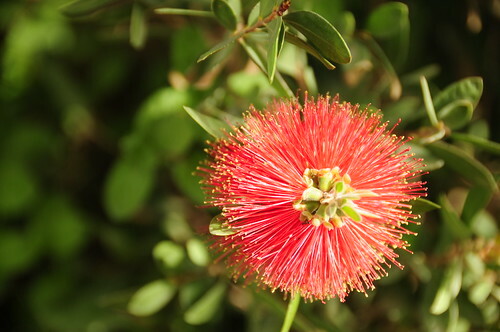 Over the course of the year it grew to 40 cm high and this week, it flowered. If anyone knows the name, please write a comment. I will post an update if I find. I’m not sure if the Mishref tree has flowered yet. I will check. If you’re interested, it’s between the supermarket and the Post Office. With Gulf Bank behind you and Starbucks on your right, it’s a little further down on the right hand side. It sits prominently and has a lot of character. 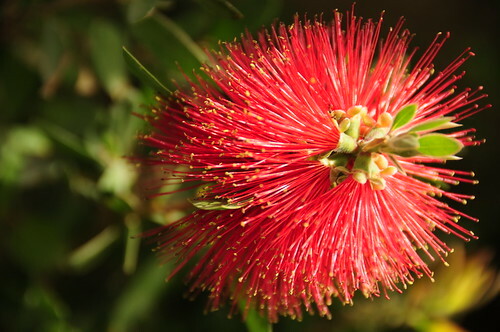 Update 9 April 2009: The flowers are called Bottle Brushes – Callistemon-Citrinus to be more accurate. my grandma used to have a tree in her garden which had flowers similar to this. 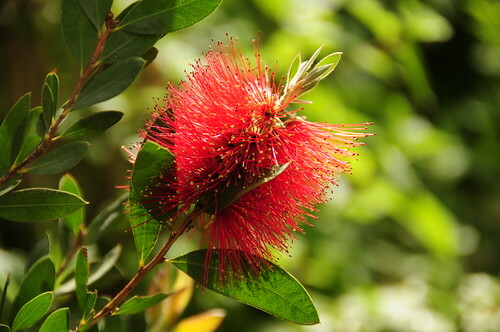 i’m not sure, but i think these flowers are called bottle brushes. I will update the post and tags. Those are some beautiful flowers! Gorgeous photos. Gorgeous! Isn’t it like one of life’s little miracles when things bloom and they turn out to be what you hoped they would be?